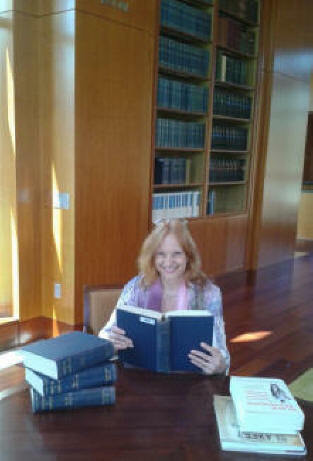 Me at the Fred W. Smith National Library for the Study of George Washington, Mount Vernon, Virginia. Setting goals is a key to success. Sacrifice helps, too. In 1999 I signed with my first publisher Domhan Books of the UK. I spent several summers in England writing, researching, and revising my 4-book Yorkist saga. A dedicated history buff and Anglophile, I’m a member of the Richard III Society, a fascinating group of learned historians, some of whom claim to have met Richard. My husband Chris and I own CostPro Inc., a construction cost consulting company in New England. I’m indulging another longtime interest, archaeology, for which I’m working on a Master’s Degree. We also love to travel. The Mediterranean cruise “Cradles of Civilization” aboard the Rotterdam included a visit to the Pyramids of Egypt. I was fortunate to visit Poland, my grandmother’s native land, and Chopin’s birthplace as well as the resting place of his heart, Warsaw. I have a Real Estate license and since 1994 I’ve owned rental condos in Myrtle Beach and New England. My stories are romances set against a backdrop of political upheaval, court intrigue, poverty, general drama of the surroundings, and sometimes a splash of the paranormal. What I’m trying to convey is that love can prevail no matter what the conflicts and obstacles, earthly or not. I recently began writing biographical novels with no fictional characters. I enjoy living in the most beautiful spot on Earth, my beloved Cape Cod. The “Without Whom” Department . . .
Domhan Books and Siobhan McNally, my first publisher, for giving me the freedom to go beyond the horizon and grow as a writer. My first agent, Janet Adams, for support over the years and for believing in me. My agents Donna and Gloria for their endless hard work. Romantic Times for the Top Pick Award and 4 1/2 star review of FAKIN’ IT. The Richard III Society for listing my books, endless devotion to King Richard, and to Peter & Carolyn Hammond in London for helping me with my research, your ongoing support, and good wishes. Warwick Castle: As I wrote in the guest book, “I love this place so much, I wrote a novel about it!” The website is almost as much fun as poking around the castle itself! Jennifer at the Salem Barnes & Noble for the author events & signings. My wonderful publisher The Wild Rose Press, CEO Rhonda Penders and my incredible editors. Laura Hogg, a beloved friend and astonishingly talented editor. To celebrate the publication of my historical novels and Chris’s and my 15th anniversary, I had this ring made for me by John Reynolds of Goldsmiths 3 in Concord, Massachusetts. 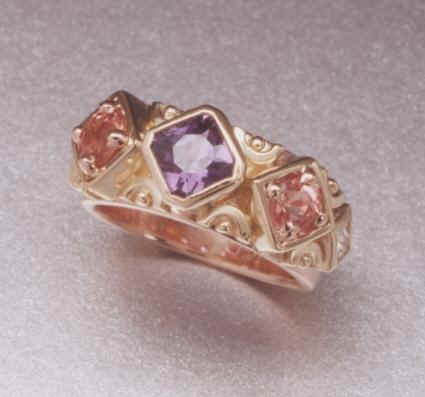 The center stone is a purple sapphire, the two surrounding stones are pink topaz, and next to them are diamonds. It’s set in 18K rose gold.